I've just finished the book Republic of Pirates and what a fascinating history it was! Sigh... I wish I was a piratical lowlife, roaming the Bahamas with a pint of rum in my hand. 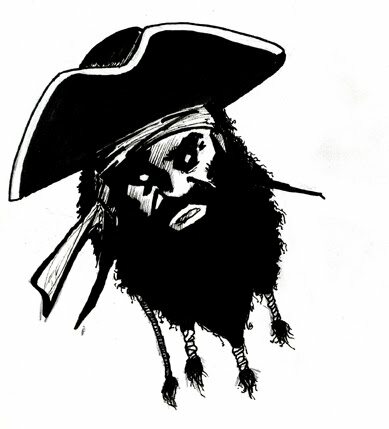 Blackbeard was the most fascinating of all the pirates for me. He'd act the maniac, lighting fuses beneath his hat and intimidating his prey with a fiery glow. He never killed any one though. Despite is savage appearance and wild eyes, he was rather a gentleman when compared to other pirates of the day, though he plundered like the best of them. And so I gave him a little tribute. Just a head shot of what he might have looked like, at least in my mind.